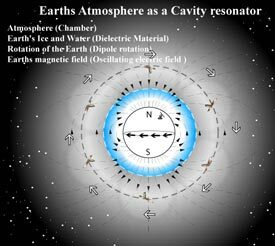 “Earths Atmosphere as a Cavity Resonator” demonstrates how satellites create a cavity magnetron in outer space. As the satellites rotate around the Earth, the earth spins in an apposing direction inside that rotation, creating a spinning style cooking chamber out of our planet. With the millions of devices on the Earth connecting to the satellites, the microwave frequencies are and an all time high constant level. This is a close up of how the satellites react with the Earth as they rotate around our planet. The electromagnetic flow of the Earths magnetic field guides all microwaves towards the North Pole. Microwave frequencies pass through the ice, water, and other dielectric material on the earth and its atmosphere, causing a friction at the molecular level, which in turn creates heat. Eventually, the friction becomes so great and the added atmospheric convection maintains higher thermal temperatures, that the ice melts and the water increases in temperature at a gradual level. Outer atmosphere water could evaporate or accumulate at a improper rate. This could be the cause of our atmosphere ozone layer depletion. With the hundreds of satellites are sent into orbit, there are hundreds of enormous satellite footprints covering the Earth. These footprints overlap each other, creating a greater intensity of microwaves. Also, because of the electromagnetic field around the Earth, the microwaves are being guided towards the North Pole. Cherry picking because I have been advised not to expect people to click on web links to find things out from source documents on this site. This is what the paper is about. I think it is relevant to EHS as it highlights the dangers even more of MWs and gives us hope for a safer future if we tell all our friends about these dangers. May be we can change the future. Because of the electromagnetic field around the Earth, the microwaves are being guided towards the North Pole. “Average temperatures in the Arctic region are rising twice as fast as they are elsewhere in the world. Arctic ice is getting thinner, melting and rupturing. The Earth is an enormous magnet with a North Pole and a South Pole. The sun’s rays are not a major contributor to the heating of the North Pole. All of the heating must be attributed to some other phenomena. The electromagnetic flow of the Earths magnetic field guides all microwaves towards the North Pole. This could be the cause of our atmosphere ozone layer depletion. I cannot create a good synopsis of this article so its best to read it, which is why I put it up. I think this explains a huge question about the worlds future. It looks like MWs are buggering it up. and we are sending you copies so that you have a chance to save them. I posted this because EHS is an environmental illness caused by radio frequencies and this article appears, if correct, to offer a great HOPE to sufferers. This is my reply to them. Most people's last and best hope is that a valid reason can be found to stop MWs and radio transmissions. If this guy is right then THIS IS A VALID REASON. Every thing will have to run on fiber optics. I will be able to go into the world again. They don't seem to give a shite about our health. Hope is the MOST IMPORTANT THING in a world on course to destroy ones health and life. As I have pointed out the key to my good health depends on finding out about atmospherics as they are the most significant factor I cannot control my self. I doubt I am the only person who thinks that this is EXTREMELY IMPORTANT. I hope to find someone who has insite into this very real and painful problem. That is why I use this web site. If I can understand and predict radiation events I would be better equipped. By the time I sense them now it is already too late. Can you explain why you think this exceptionally clear presentation of what is happening regarding "Radio Frequencies and the Environment" of the planet and is destroying my good health is not fit to be on your web site please? EHS is an environmental illness caused by radio frequencies.